I’ve been gluten-free for over three years now, and without getting up on my soap box, I know it is a diet that works for me. I used to suffer from all sorts of digestive issues; cramping, bloating, irritability. I would always complain about how my stomach hurt, how I felt fat and gassy, how I felt uncomfortable. In fact, I tried all sorts of other things, including going vegetarian for two years, and what my friend calls a pseudo-gluten-free diet (I ate gluten free-ish, minus beer, when I was in New Zealand… turns out, that is not a gluten free diet whatsoever). Anyway, nothing made me feel better, until my boyfriend’s mother recommended I try out the strict gluten-free thing. She has Celiac disease, and so does her mother and daughter. I am lucky to have a super-supportive boyfriend who, although testing negative to the genetic assays for Celiac disease, threw out his gluten-full pizza and donuts in favor of sharing the same diet as me. One of the things I have come to appreciate is the ever-expanding market for gluten free goods today. Three years ago, it wasn’t difficult, per se, but it wasn’t as easy as it is now. I can’t even imagine what it would have been like twenty years ago. While the gluten free diet is more expensive than the regular run-of-the-mill diet that includes Wonder bread and Ramen noodles, it does encourage a follower to cook more for themselves, and to learn to love the kitchen. While rice and veggies are a staple in my diet, I am still able to enjoy my lifelong favorite foods, like spaghetti (Tinkyada makes the best gluten-free spaghetti noodles I’ve ever had), peanut butter and jelly (thanks to Larabar), and the best bagels I’ve ever had (gluten free or not) from Against the Grain. Sure, I cut back on grains because spending $7 for a loaf of bread is redonkulous, but it helps me to appreciate the (gluten free) grains when I have them. Since moving to St Louis, I have found a few awesome places that cater to the gluten-free folk, and I feel even luckier to have come across a local gluten-free bakery (Free Range Cookies) that distributes their goods all over the metro-STL area. Free Range, if you haven’t already tried it, has the best gluten free baked goods I’ve ever had straight from the source. The owner, Linda Daniels, is a cute, peppy young woman who is seriously on top of her game. I was introduced to FRC because I saw the cocoa crinkle cookies at Kaldi’s, and when I saw they were made in Ferguson, I knew I had to take the hike up there. Granted, it’s not that far from where I live (maybe a 20min drive), and it was totally worth going to the cute town of Ferguson to check out the shop. Free Range had several different samples to try, and I felt like I could have skipped lunch before going there. I stocked up on all sorts of gluten free goodies, including baguettes (which are doughy on the inside and crispy on the outside, just like gluten-FULL bread is. I don’t know how she does it…), more cookies (I got the almond quinoa and more cocoa crinkles), and even cupcakes. She had all sorts of non-cookie fare, including focaccia, burger buns, and pizza crusts. I couldn’t buy everything, but I did dish out for some biscotti because I love the Free Range chocolate chip biscotti. Also, a friend of mine recently started a gluten-free diet because she was also having some GI dilemmas, and I feel like the luckiest person in the world. She made a few dozen Girl Scout Samoas, gluten free of course, and Baberaham brought them down this past weekend. Ho.ly.crap. They are so good. Crumbly shortbread cookie covered in chocolate, with a sweet coconut sugary ring on top. I felt like I had gone back in time to when I would eat Girl Scout cookies, only I am pretty sure these things were better than the “real” thing! They were bigger, too. So, good on you Sam, for jumping head first into the gluten free lifestyle. You are doing a great job, and I am so proud of you! 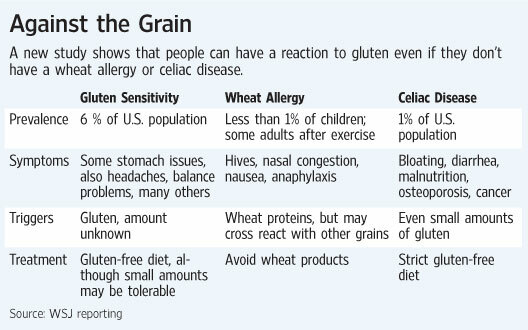 Recently, the Wall Street Journal shared an interesting study from BMC Medicine about gluten sensitivity, wheat allergy, and gluten intolerance. The article discusses how gluten sensitivity and Celiac disease differs, and it sheds light on different symptoms and classifications of the two disorders. Using gut permeability assays, histology of gut biopsies, and mucosal gene expression, differences between Celiac disease and gluten sensitivity were discovered. What does this mean? Well, besides the obvious (gluten free diet recommendations for gluten reactivity across the board), there may also be slightly varying ways of treating people with gluten sensitivities. While Celiac disease can be considered an autoimmune disorder, which is now easier to detect based on serological tests for common antibodies, gluten sensitivity is much more difficult to diagnose. When people ask me: “How did you know you needed to be on a gluten free diet? Did you get tested?”, I tell them I just gave up gluten and simply felt better. Even if I had been tested, I may have turned up negative for Celiac disease. But to me, following the gluten free diet made my GI symptoms go away, and that is what mattered the most. This new article in BMC Medicine attempts to uncover whether there may be other ways of diagnosing gluten-reactive disorders, even those that were otherwise considered ambiguous, like gluten sensitivity. There may be a difference between sensitivity (perhaps an innate response) and Celiac (likely an adaptive response), and there may also be potential for the development of molecular diagnostics that can help us to clinically assess each individual issue. Or, the patient can just try the diet, and see if it works. Some people need the answers, and that’s where a study like this can help get us there. Ohh, the places you’ll go. Or in my case, come back to. I got my bachelor’s degree from Michigan Tech in 2005, left for a few years to get my master’s in Montana, and then came back. Why? Because I love the UP. I am stoked about my advisor’s research. and I want to pursue a career in academia. Of course, I haven’t received my doctorate yet. But while all this is still fresh in my brain (somedays my brain is more fresh than others), I’d like to share with you what I’ve learned over the last X-number of years. Graduate school is a time in life where your earnings far outweigh the incredible things you do. Wait, scratch that! It’s the complete opposite. Unless you have some awesome fellowship like NSF GRFP or go to a university sponsored with IGERT funding (or have an endowed advisor that can give you lots-o-money), you can make enough … to scrape by. And even with a fellowship like that, $30,000 a year in some places isn’t a whole lot of money to get by (San Francisco has a cost of living 53% greater than Minneapolis ). On the flip side, some schools have fairly high graduate student stipends (graduate students at Harvard make an average of $31,700/year and Princeton sits at $29,300 ). At Michigan Tech (my school), the minimum graduate student stipend for someone with their master’s degree (and after passing all qualifying exams and their proposal defense) is a little under $19,000 . By any stretch of the imagination, <$20K a year is not really living in the comfort zone, which is why it always amazes me that some graduate students can juggle having a family, and having kids, and getting their PhD. My friend Matt, a fellow grad student with me, just had his first child this year. Kudos to him, and those of you out there that are so gifted to be able to balance life, work, and family. That being said, I supplement my income with student loans that help me have more breathing room (and help me enjoy some things away from school as well, including sports and healthy food). Anyway, I digress: having no money– that is a definite downside to grad school. Why downgrade to making less than 20K a year when you know (at least as an engineer) you could get a job that pays $50,000 right out of the gate? I know as an undergrad, at least when I was a freshman/sophomore, I was looking forward to getting my degree and getting an engineering job. That’s what I was told: engineering degree = lots of money. Seems logical to choose such a profession. But I changed my mind. All of a sudden, it wasn’t all about the money anymore. 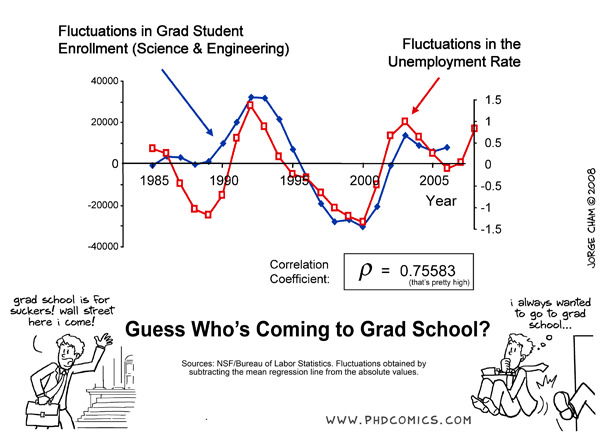 When I told my dad (as a senior undergrad) that I wanted to go to grad school, he couldn’t figure out why. Spend more money on school, and for why exactly? Logical questions that needed answers. Yes, I know. It’s a comic. But its based on actual data from the National Science Foundation and the Bureau of Labor Statistics. The comic strip- Piled Higher and Deeper, is written by Jorge Cham, a mechanical engineer turned instructor who now travels and writes comics and helps others with low self esteem (ahem) grad students come to terms with the triumphs and tribulations of grad school. Interestingly enough, I am seeing more folks changing gears and going from industry back into academia, especially around the time of the economic fall out. It’s more difficult, because the graduate student pool is expanding, to secure graduate funding and support such as research and teaching assistantships. I suppose it comes down to ‘what else are we going to do’ but go back to school, when the job market is tough and employers are looking more and more for higher-ed employees. Anyway, it’s interesting. I’ll leave it at that. Graduate student life is not all that bad. Seriously. It’s one of only a few times in life where you can make-your-own-schedule, kind of. Some advisors require their students to stick to a 9-5 schedule, but for the most part it is generally accepted that, so long as you can get the work done, you can come and go when you please. Depending on culture, teaching responsibilities, and social life, I have seen other grad students come and go from my building at all hours of the day. Yes, there have been times when I have been there at practically all hours of the day (including the 8am-3am shift, or the 4am run to check on an experiment). As an undergrad, I had never pulled an ‘all nighter.’ But as a graduate student, things are different. I mean, my life depends on these experiments. I literally have gone to bed at 9pm, set my alarm for 1am, and went back into work. As a grad student, I’ve received tests back without grades on them. I’ve learned how to say “I don’t know” as eloquently as possible (I’m sure you’ve heard: “That’s an excellent question and its something we should consider for future investigations“- right?). I’ve learned how to bull..logna my way through a difficult question or two. I am also learning new stuff every day, whether it pertains directly to my research or not. I’ve learned the ins and outs of all sorts of things, from optimizing quantitative PCR to getting a facility up and running. I’m learning that some situations are less fair than others, and that it’s not really worth arguing or getting upset over (and to just get the job done). Sometimes, all I want to say is: “That is not my job.” Sometimes, I do say that. Quietly and to myself (or my cat). Because even if it isn’t your job, it’s probably something that needs to get done in order to do your job, so it really could be your job, so just do it and shut up. I usually end up stepping back and saying; “That is my job. Being a grad student means anything could be your job.” Need something machined? Learn how to use a mill. Need to figure out your statistical power? 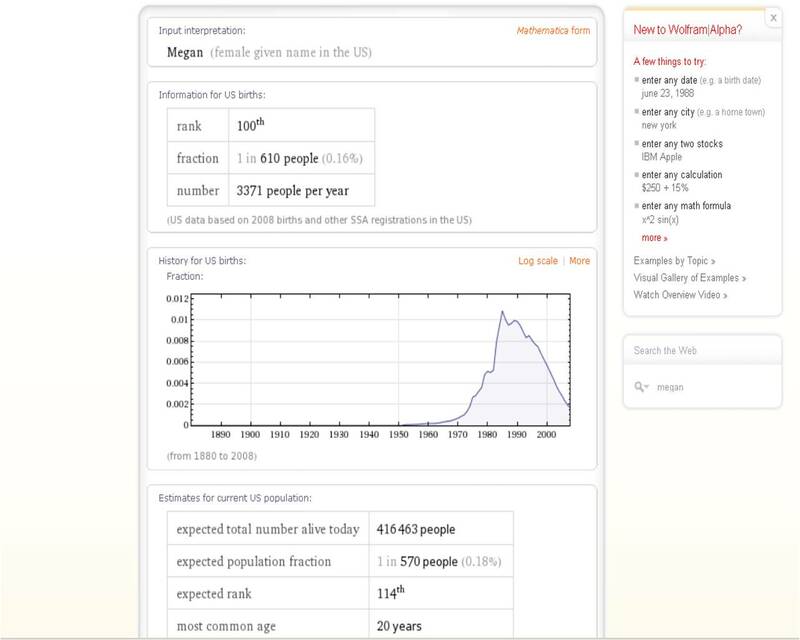 Find a stats book. No one is going to hold your hand, at least- no one should have to. Because in reality, being a graduate student means being a sponge, soaking in all that you can for the limited amount of time you have. Being independent. Learning how to be a primary investigator, with the guidance and advising of your P.I., of course. Thanks to Piled Higher and Deeper for letting me share their comics in this post! For more hilarity (and some learning experiences), check out PhD Comics here. 2. Glassdoor.com, See what employees are saying. Online search database for company salaries, reviews, and interviews. A grad-school friend of mine encouraged me to listen to WNYC‘s Radiolab on our Union Break one summer morning. I got hooked, and found that listening to the latest Radiolab got me through lonely runs and labtime and writing in my office. It inspires me to think about different things than my typical research stuff. Plus, I really enjoy learning. So on this sunny, Sunday morning, I decided to listen to the recently released Radiolab instead of saving it for my drive downstate. It was quite possibly the best motivator to get me out of the funk and out the door on my bike. Julie and the Radiolab gang discuss the limits she faced in that fateful day. She refers to it as watching “a train wreck”- The limits of human physiology, moreso than psychological limits, are what forced Julie to crawl. Her muscles cramped, her legs slowed, and she collapsed. Her legs just didn’t work. Julie’s determination got her across the line that day – this little voice telling her to “get up” – forced her to crawl across the line. Robert brings up a good point, in that the voice she heard didn’t tell her to stop, to give up. Julie interjects, that voice would be her ego, and that voice was overpowered by this other voice that changed her life. So according to Julie Moss: Psychologically– there are no limits. What about physiologically? David Jones joins the show, a retired physiologist that had performed a study on cyclists and energy intake. The hosts discuss the Central Governor Theory, which is basically the “limiting” signal generator that allows your body to maintain its energy reserves for emergencies. It tells your body “HEY! I am done! No more energy, no more activity, stop what you are doing because I ain’t got anymore juice!”- but really, the body probably has a little bit of reserves left. Basically, it governs your energy expenditure just like an engine governor (like on a school bus) limits speed. And just like an engine governor, it’s thought that it can be turned off. So how far can you take your body? People race the Race Across America, Ultramans, ultramarathons, and all other sorts of incredibly tough endurance activities. How do they do it? What is going on in their brain and their body that makes them able to do this? Find out! I encourage you to head over to WNYC and NPR to listen to the latest Radiolab podcast! While it won’t answer all the questions (and it will probably raise even more questions than what it starts with), Radiolab is science + entertainment, and it definitely makes learning more fun. The blogosphere is quite entertaining sometimes. It really surprises me how small a world it really is, and it’s really encouraging to find “others like me” in a world that I once thought was so big. In the mix, and I’m not exactly sure how, I found Frayed Laces. She is a grad student (like me), a runner (like me), and a fairly-newbie triathlete (ok, I think you get the point). No, we’re not the same person. She’s definitely not on a gluten free diet, and she lives in Hawaii. And she studies different stuff (but she does junky on the Matlab every once in a while). Recently, she put the word out on the interwebs about a grad student/gal discussion she wanted to host. She sent me an email and I was quick to respond. The topic– Balancing Graduate School and Training: A Female Perspective. Who could pass that up? Check out our dialogue on her blog at Frayed Laces. Here’s hoping I didn’t say anything incriminating, because I know my advisor reads this (ohh, interwebs). As I wonder and plunder through my third year of grad school, I get a breath of confidence every once in a while that I may graduate in the near future (and then proceed to be hammered back to shore by the waves of reality). Last spring, I focused my efforts to get to research-only mode so that my advisor could save money on tuition and I could make an extra $250 a semester in stipend. Trust me, that $250 was significant. Recently, however, I started thinking about the next step: the Post Doc. Currently, I’m putting the pieces of my doctoral puzzle together, in the form of a dissertation (it’s in its initial stages, known as The Outline). It gets me starting to wonder what lies ahead. Seriously, I know that jobs are few and far between, and being in school for so long might put me in a position to be “over-educated and underpaid”. So the best strategy to tackle my next-phase step is to ask: What is it that I want to do with my life? Since I ask myself this question every time I fill out a fellowship application or write an essay entitled “What it is that I want to do with my life”- I should really know the answer. But the truth is, what exactly I want to do with my life next is dependent on what exact opportunities are available when I defend my dissertation and move on from the graduate school lifestyle. Having flexibility, exploring new areas of science, and continuing to learn and expand my horizons, now that is what I want to do with my life! Since I know that I want to go into academia, the next step is to look for a post-doc or a teaching position. I know that I love doing research and I love learning, so let’s say my next step is the Post-Doc. I’ve recently discovered RePORTER from the National Institutes of Health (NIH). Formerly known as CRISP, RePORTER is a new and updated version, used to find out who has been awarded a grant (or grants) from the NIH recently (updated weekly), what research they were awarded money for, and how long their grant money will be there. Want to know how much the faculty in your department were awarded last year? Type in their name. For me, I’m planning on scoping out potential laboratories that sound cool and checking if the PI (primary investigator) have money to support research. If you are a pre-doctoral life sciences student and you want to try and get funded without a graduate teaching fellowship, one option is to apply for the Ruth Kirschtein-NRSA Pre-Doctoral Fellowship through the NIH. In order to be awarded this, one must first establish a relationship with an NIH-funded faculty (ding ding ding! Use RePORTER to find these faculty). It beats going door-to-door and asking. RePORTER is really neat, too. I tried searching for PI’s in Michigan, Minnesota, and Wisconsin who have received money from NIAMS (National Institute of Arthritis and Musculoskeletal and Skin Diseases). It was really interesting to see who was doing what research in my region! 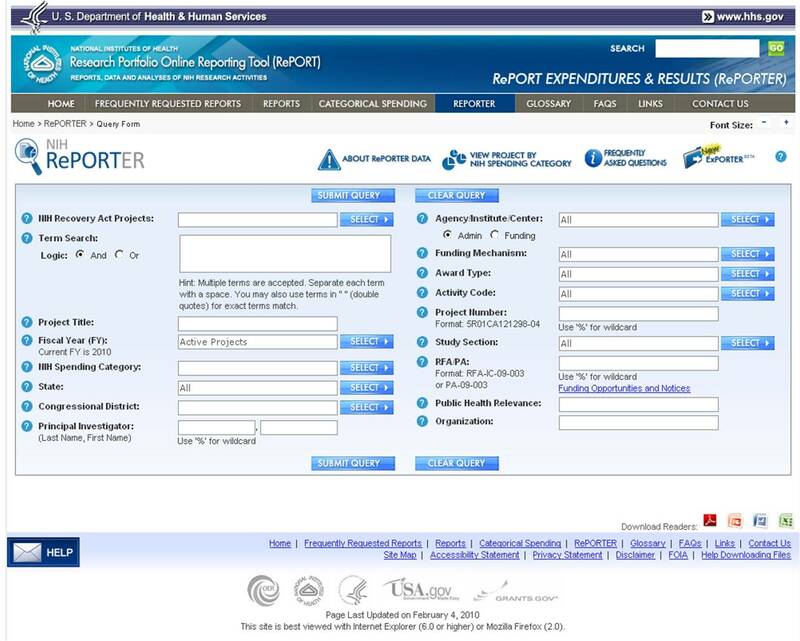 RePORTER can be used to navigate through all different search procedures, like Funding Mechanism (training grant, SBIR, research projects, etc), Award Type, State, and organization (such as university). Now you can find out who has what kind of money, because it will list the award cost, too! Every researcher in bio-based science should know about PubMed. It’s an online database for compiling manuscripts that have been accepted to peer-reviewed journals. Depending on your university or library, you may not be able to access all the manuscripts listed on PubMed without paying a fee, but most medical schools and universities have Free-Access permissions (and if that doesn’t work, try to Interlibrary-Loan an article you can’t seem to access). The most important thing about research is knowing what has already been done, and what needs to be done next. Reading about what others are doing, and staying on top of the literature, is key! I use PubMed practically every day to try and find new articles or articles I may have missed, especially while preparing manuscripts for submission (and preparing my dissertation, too!). Remember when you had to write papers for school, and you had to use references and form a bibliography at the end? Please tell me you don't just cite Wikipedia!?!? EndNote is a really awesome tool that helps make writing papers a whole heck-of-a-lot easier. First, take all those journal articles you have stacked up on your desk. Second, enter in the title, author, journal name, etc. into EndNote. Hit save. Type your paper like you normally would, and when it comes time to enter a citation, click on the paper in your EndNote database, click insert, and voila! You have an automated bibliography. If you are planning on submitting the paper to a peer reviewed journal, you can change the format of the citations and bibliography even after you drafted the entire paper. Simply change the reference format and it automatically changes all your citations. Sooo much easier than going in one-by-one on your paper. Plus, you don’t have to worry if you are using annotated, alphabetized, or numbered citations. It’s all automatic. Makes grad school survivable, anyway! !